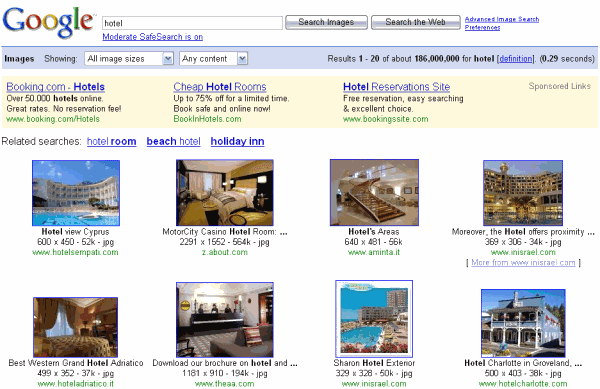 After months of experimentation, Google choose to show text ads above image search results. It's not clear if the ads are actually useful for those who visit Google Image Search to find images, but Google mentioned last year that the volume of commercial queries has increased significantly. "Whenever we make changes like these, we carefully evaluate users' reactions to ensure we're holding true to our basic principles: that ads by Google should always be relevant and useful. Of course, these experiments benefit Google because they generate revenue from new sources — but by ensuring that we show the right ads at the right time to the right people, we'll add value for users too," explained a Google blog post from November. In 2006, Google estimated that it could earn $80-200 million a year by including text ads in Image Search. Google decided not to monetize Image Search because the experiments showed that people used the service less. I wonder if the experiments from 2008 showed different results. It's worth mentioning that the only other important image search engine that shows ads is Ask.com Image Search. @Anonymous: Since search is the means to find content, not the desired content itself, I don't find collapsible ads all that useful in a search context. Collapsible ads are useful if you're trying to view content without distraction, but if you're only going through anyways, taking the time to collapse the ads defeats the effort. As for the ads in Google Image Search, I'm not sure if the top bar is the best place for them, but I'm not too bothered. Though, I'd prefer sidebar ads, as in Web Search. Even sidebar image ads, as long as the images are clearly distinguishable from results. I find these ads very, very invasive. If they have to be on top, they should use only one or two lines. I don't want to sound negative, but this makes me lose a bit my faith in Google. Why didn't they put the ads on the right, like in Gmail? I'm sure the results from 2006 and 2008 were the same but the economic climate has changed and a few less queries is worth a few more million. I really hate these ads, they're completely invasive and I would much prefer if they were displayed on the left had side of the page similar to google search results. Is Google trying to make more money in the recession time? Can you please make a list of where in their sites they have displayed ads? I didn't even realize that there were ads--since either AdBlock Plus or CustomizeGoogle blocks them. Given how easy it is to block all of these ads, why is anyone complaining about their being invasive? Just opt out. Google isn't dumb--they won't be penny-wise and pound-foolish by pushing ads so hard that they alienate users. After all, they only make money on click-throughs (I assume these are all PPC ads). I don't see how the ads are obtrusive. When you use the image search, you look for pictures, so you kind of automatically jump over text ads. Now picture ads - those would in fact be more distracting. Never quite figured out why Google gets bashed for having ads. Hey, people! It's free! Is someone forcing you to click on the ads? Your TV has commercials which you cannot easily avoid and which use some of the time you are paying for. Did you throw out your TV set? If your complaint is just about the choices Google made for screen layout, I suggest you get a life. Yes, of course, nothing wrong with that. They have to monetize their services ! They were tested images ads. I think I would have prefered ! google appears to be monetizing where they can and also cutting back costs where they can across the board at the moment, including leaving a lot of people go.. The only evidence of people being let go from Google have been 100 recruiters. The company is not growing at the scale it once was - hardly surprising really - do you really take that as evidence of penny-pinching? This is part of the experimentation every company does. Again if the users like this feature, then google will win. If users don't like, I am sure google will remove it.